So I somehow migrated this game to Steam. How can I accuse Uncle Laurent for an attempted assassination without being a Lumen? I know I've done it before and I don't know if anything has changed since the last update. Can anyone help me find a way to accuse Uncle Laurent for an attempted assassination without being a Lumen? I started playing this game again so I've become a little obsessed. Haha. You get the option to accuse Laurent of treason if you face an assassin in Week 16 and can then decipher the coded letter that they leave behind, and it says that the assassin came from Merva. It's possible for this assassin to be from somewhere other than Merva though, if I recall correctly. As for the assassin, if you aren't a Lumen I think you need to pass checks for Reflexes, Flexibility, and either Polearms if you choose to fight him or Running if you choose to run away. Even I would have to look it up to be sure but - I think in order to trigger a Mervan assassination attempt without being a Lumen yet, you would need to have found a reason to write to Charlotte. Which would require that Elodie gets bitten by the snake and healed by Charlotte, then maxes out meditation enough to get the 'glowy' effect, then talks to her Lumen mentor about these mysterious non-Lumen powers. But this is off my memory. I believe you need the crystal (hence become a Lumen) and have high meditation to write to Charlotte. Could you falsely accuse Laurent of sending an assassin if Banion sent it after you instead? I tried that as well but didn't work. + Julianna had to be present when the snake attacked, to warn Elodie that someone was trying to kill her. If all that happens, she becomes suspicious of Laurent and has the option to accuse him. 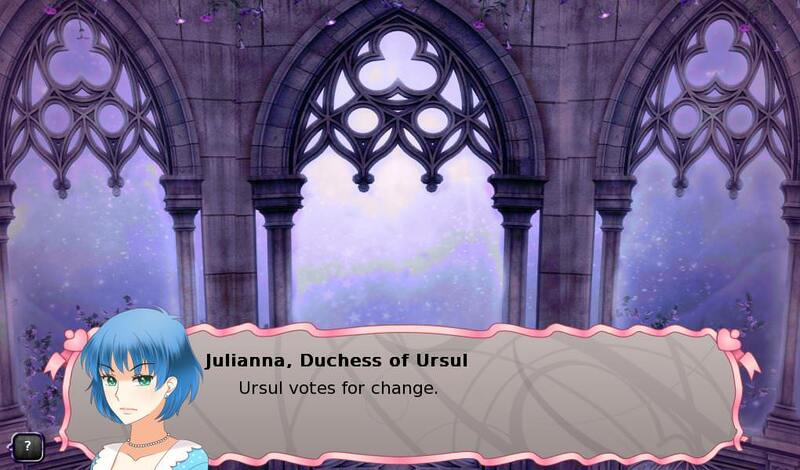 Hey, I read in LLTQ wikia that you can get Julianna to vote 'no' at the ball if you get the crystal and refuse to accept it multiple times. Is this true and if it is, how do I achieve that? It's in my script notes but it's been long enough that I don't entirely know what my script notes mean. That is, my notes say that Julianna votes against you if you have refused "again" to become a Lumen. My best guess is that you have to get the crystal early, talk to Julianna, and then when she asks if you're ready to become a Lumen, say no. If you do this before the parade, then you should get the salt water omen at the parade. The weekend after the parade and before the ball, talk to Julianna again, and she gives you a second chance to become a Lumen. Say no again. Then, if there's a vote of no confidence, she should be fed up with you. I don't know if anyone's actually ever done this, though! This resulted in basically only Joslyn and Armand taking Elodie's side. When I tried again and specifically aimed to improve noble approval (and didn't invite Talarist to the ball), then Severin joined Elodie's side too. I don't think it's possible to have the voting scene and then win the game without Julianna's vote.